When we almost can’t remember what it’s like to go a day without name-calling, without lies, harshness, or callousness. 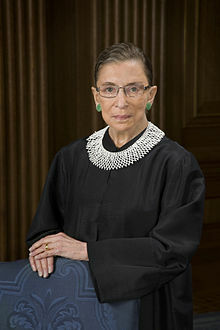 We still look to you, Ruth Bader Ginsburg—yeshiva-girl-turned-legendary-justice, RBG icon, fighter for the powerless and wronged. May you go from strength to strength because you have been ours. May you live many more years because you make the world brighter, fairer, kinder….Because we need you. You have helped us remain clear—not just on the foundational principles of a nation, but on our Jewish mandate: to welcome the stranger and never to stand idly by. The Hebrew words on your office wall in calligraphy read, “Zedek, Zedek, tirdof: Justice, Justice shalt thou pursue.” You have. And we’ll keep trying. Abigail Pogrebin is the author of My Jewish Year: 18 Holidays, One Wondering Year and Stars of David: Prominent Jews Talk about Being Jewish, for which she interviewed Justice Ginsburg.